In this 2-day course, participants learn how to weave the powerful ToP Facilitation Methods into an integrated approach to strategic planning that results in strong consensus and commitment. The resulting plan is realistic, achievable and easy to monitor. Members: Visit the members-only Strategic Planning page to explore resources specifically related to this course. Visitors: Explore these great public resources illuminating ToP's unique approach to strategic planning. 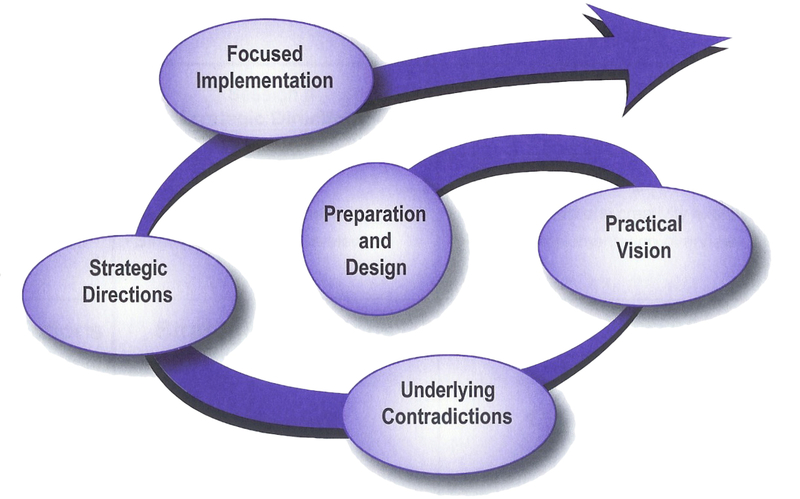 This helpful graphic lays out the participatory strategic planning method in a spiral with brief explanations of the components. Strategic Planning Phases as ArchitectureThis visual depiction uses building metaphors to explain the phases in development and implementation of a strategic plan. In this chapter from the Change Handbook, Marilyn Oyler and John Burbidge do a deep dive into the theory, process, and conditions for success for the ToP Participatory Strategic Planning Process. In this article from Brian Stanfield, the implicit benefits of each step in the ToP participatory strategic planning process are examined through his theory of transparent strategy.